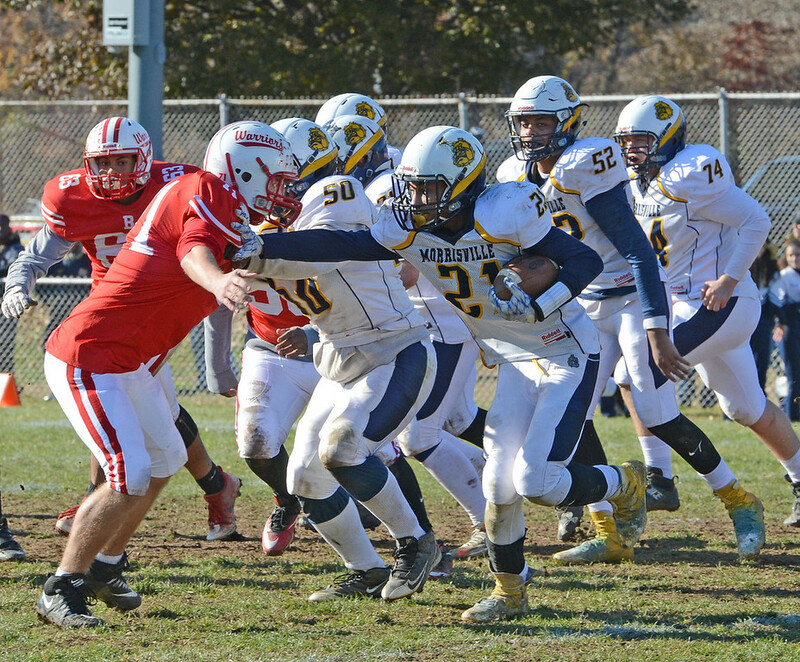 Eric Bell (20) and Eishon Perry (1) collide going for pass. 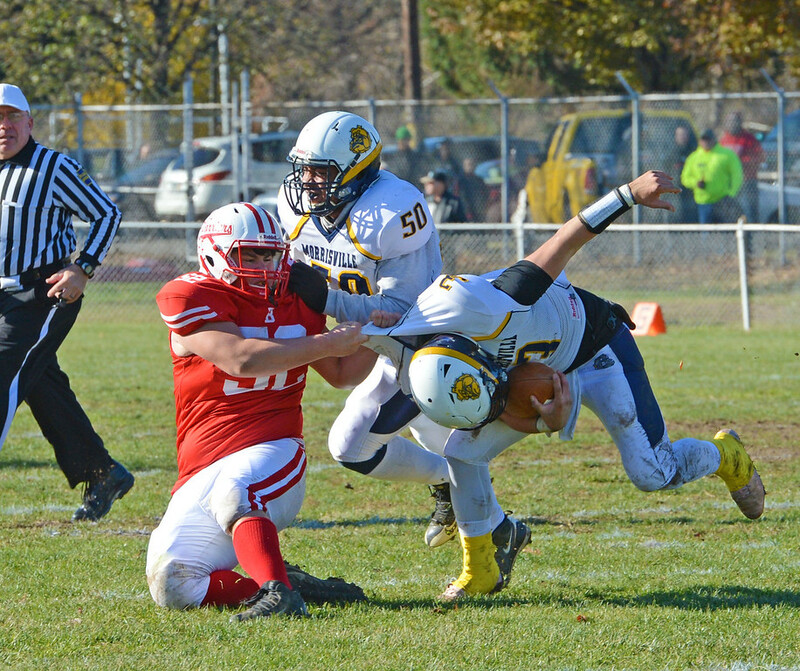 Bristol senior Danny Collins (52) drags Felix Feliciano (3) to the ground. 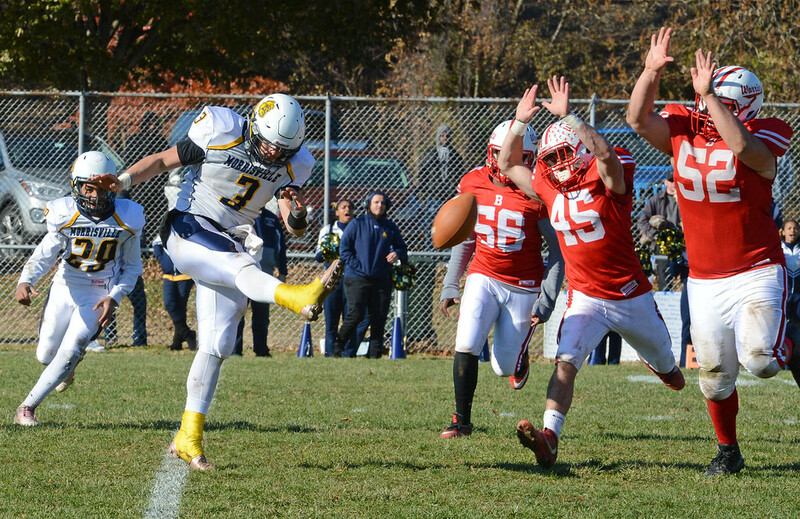 Danny Collins (52) and Lucas Bogarde (45) attempt to block Felix Feliciano's punt. 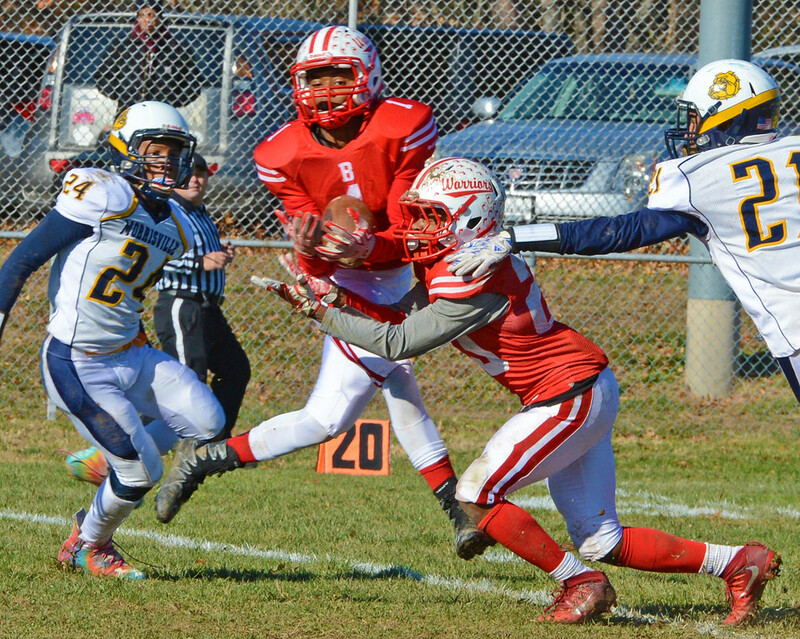 Bristol senior Deshawyn Cortez (34) breaks free for a touchdown. 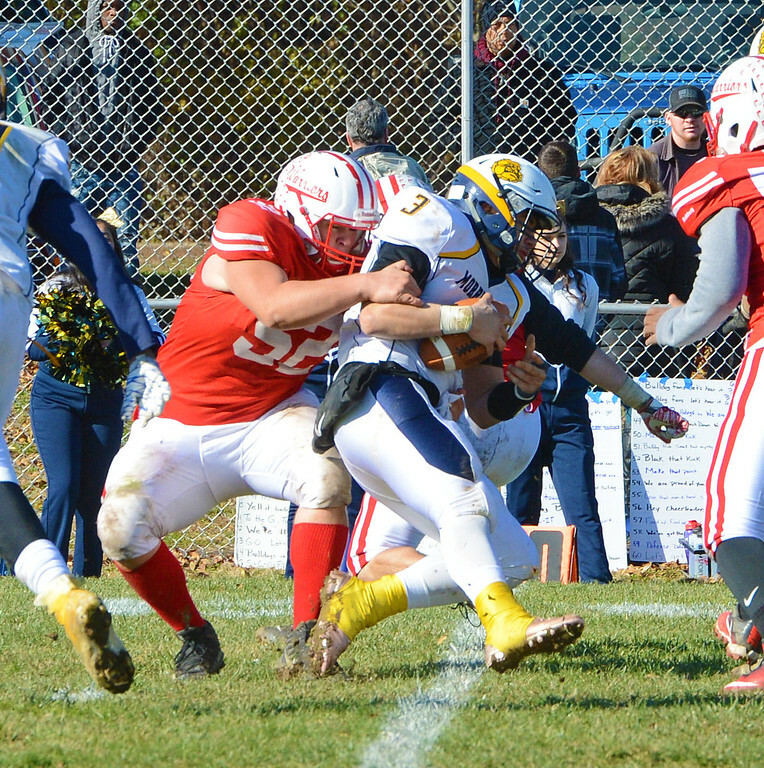 Danny Collins (52) sacks Felix Feliciano (3). 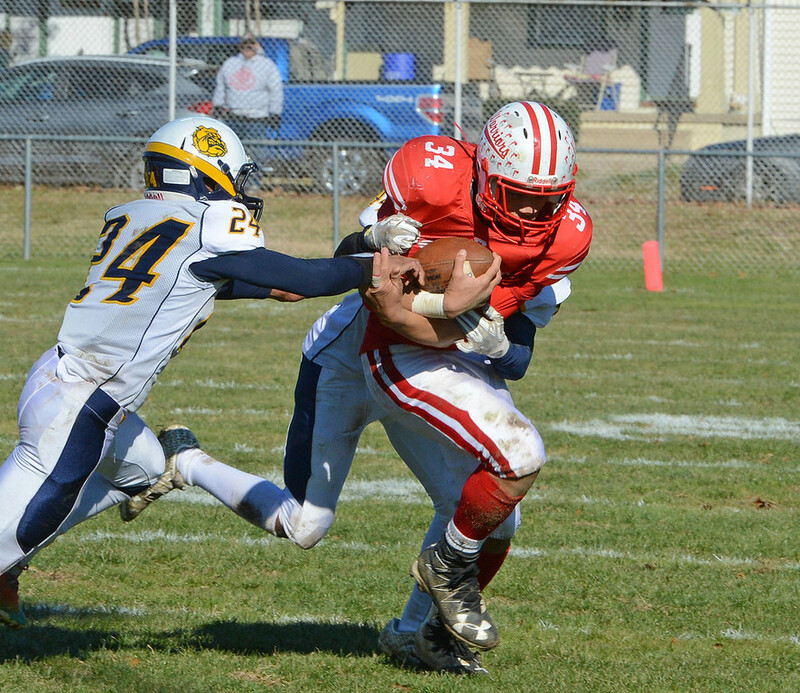 Bristol senior Deshawyn Cortez (34) hurdles fallen mate. 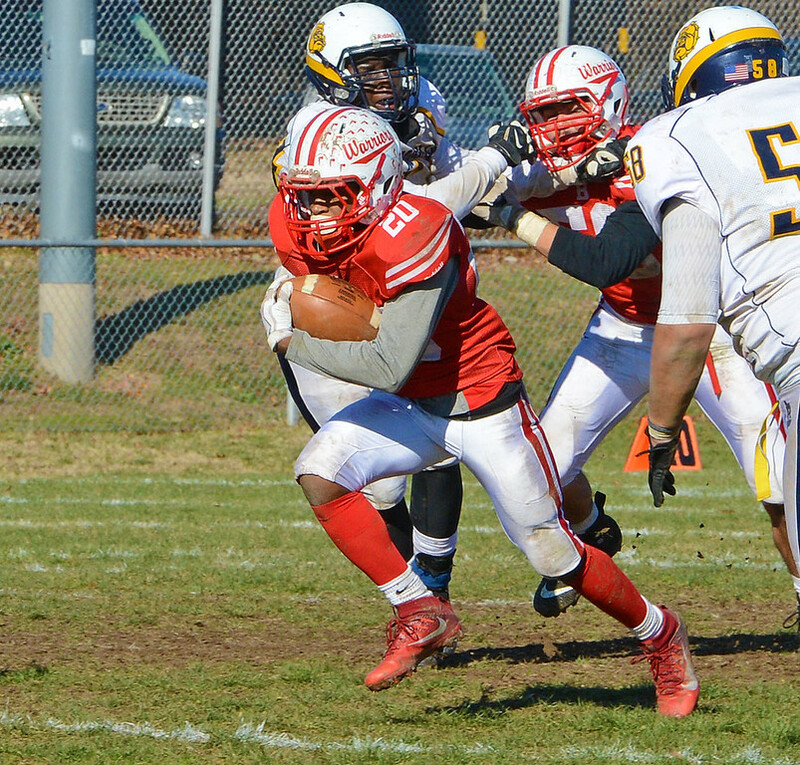 Deshawyn Cortez (34) rushed for for 50 yards. 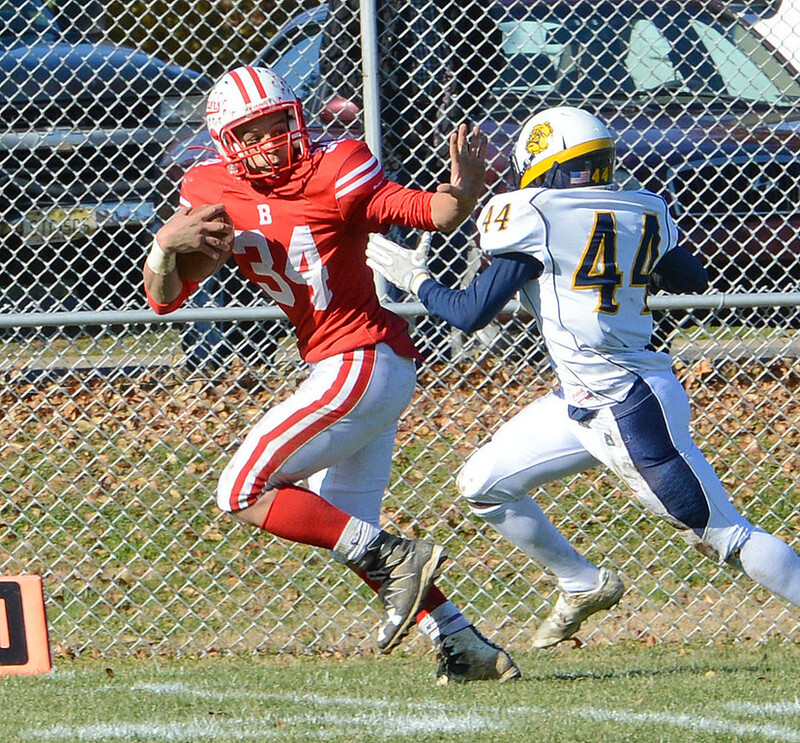 Deshawyn Cortez (34) tries to break away from Roy Thomas (58). 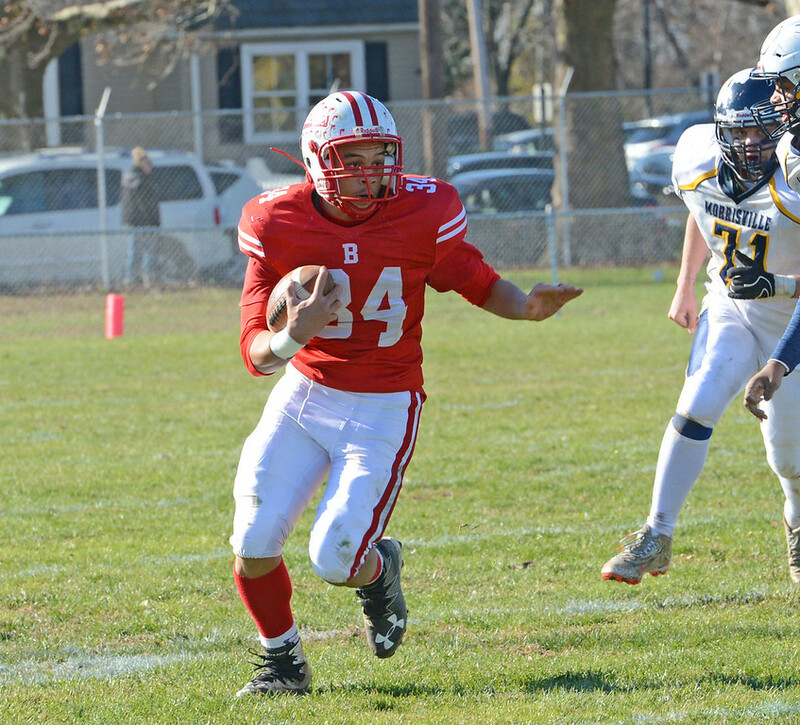 Deshawyn Cortez (34) scored twice for Bristol. 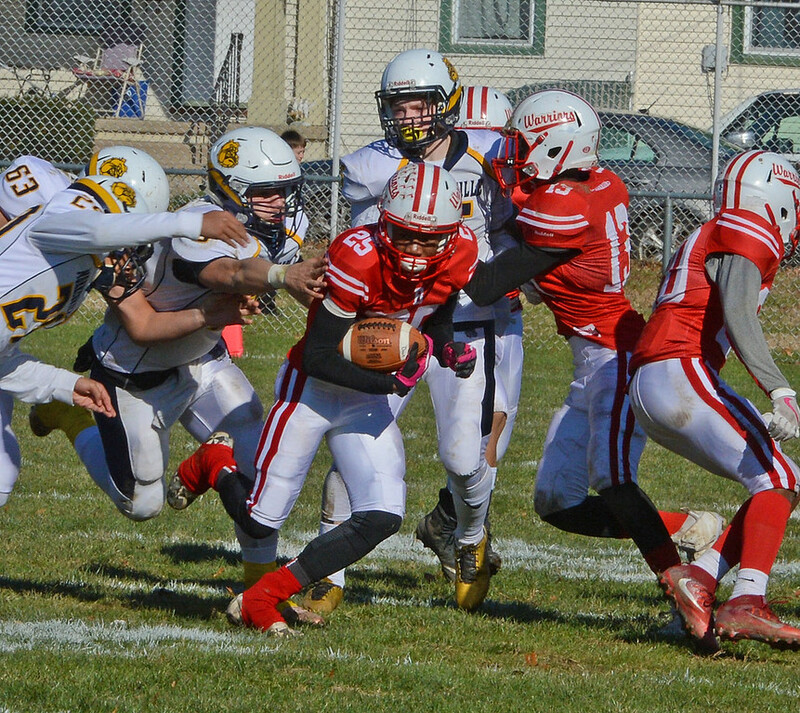 Eric Bell (20) breaks away on 42 yard TD sprint. 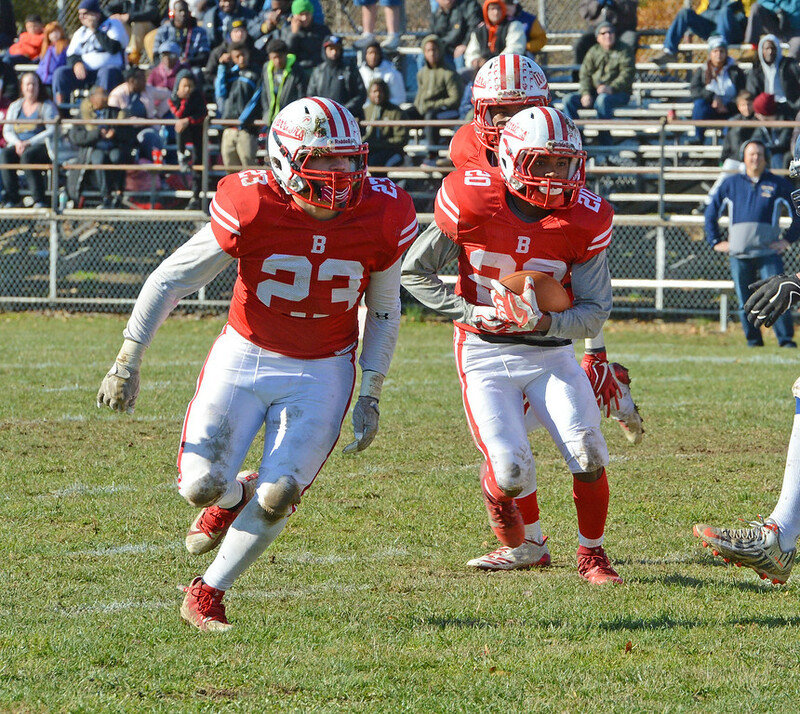 Eric Bell (20) breaks free from JaQuese Little (24). 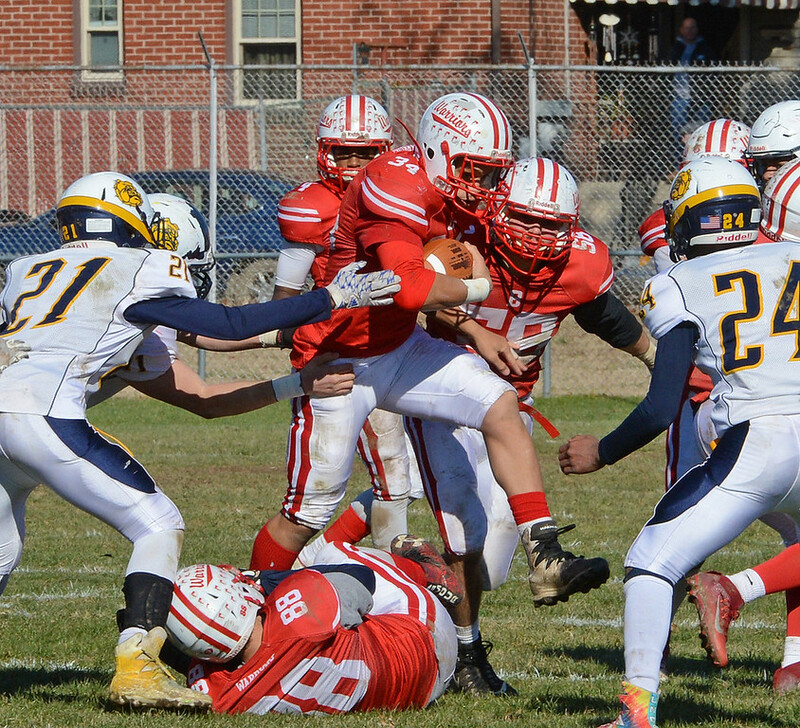 Eric Bell (20) follows Allen Reyes' (23) block. 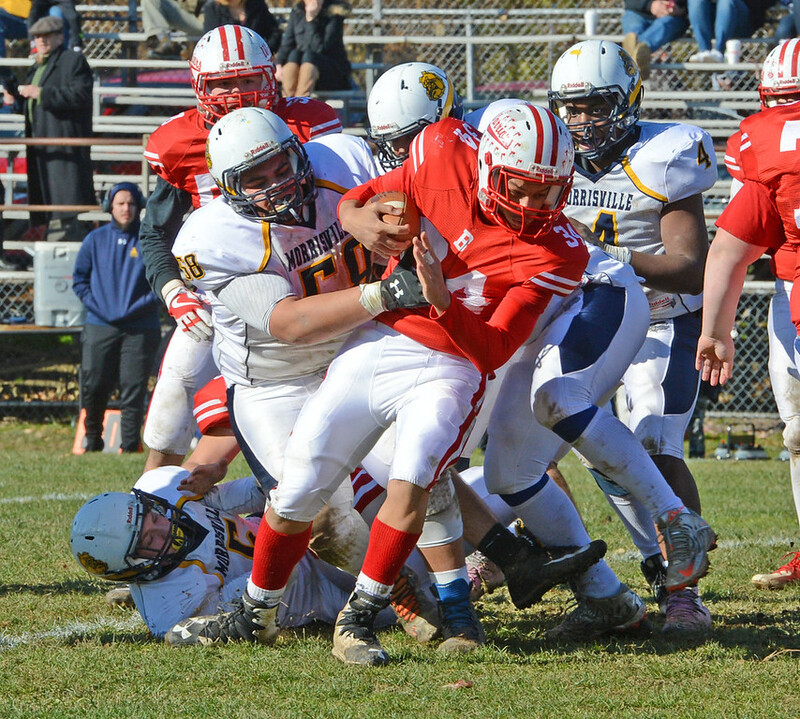 Eric Bell (20) is sandwiched between Mike Larkin (44) and Breon Hines (52). 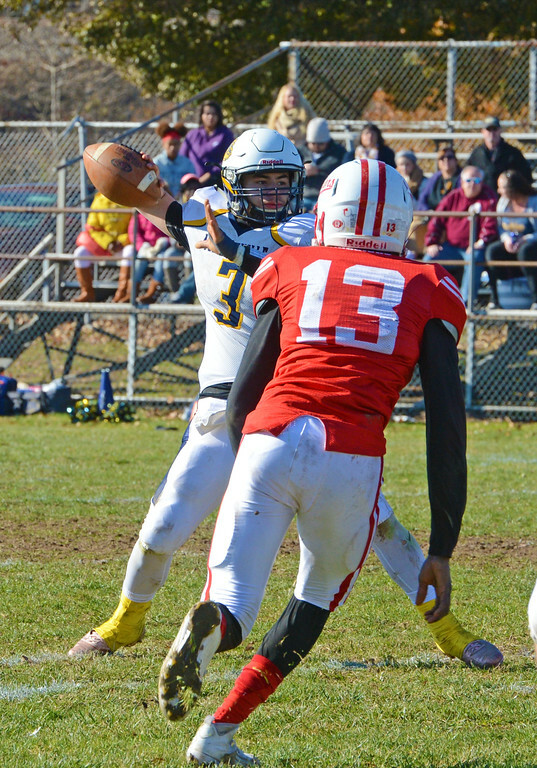 Felix Feliciano (3) gets pass off before Mike Are's (13) arrives. 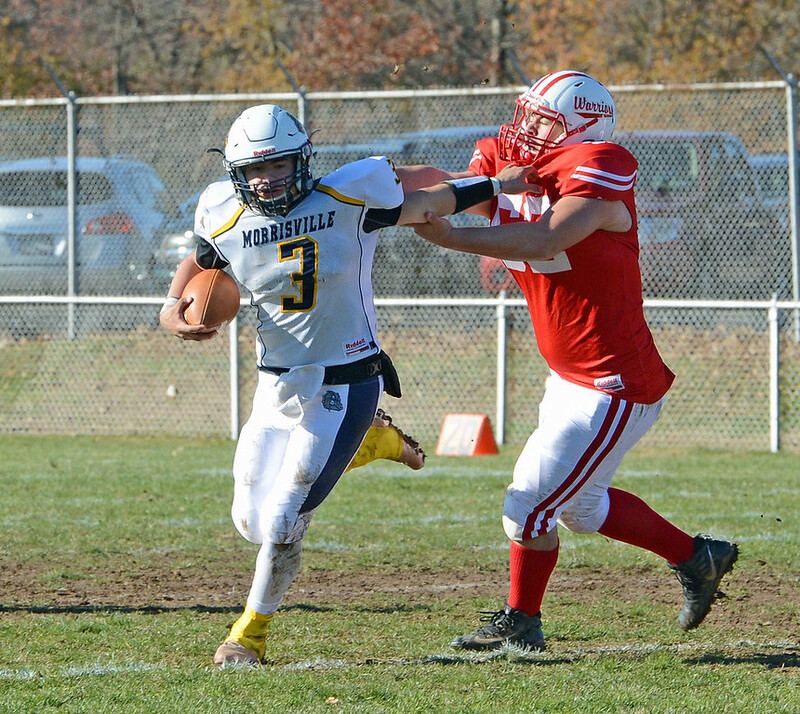 Felix Feliciano (3) is pursued by Danny Collins (52). 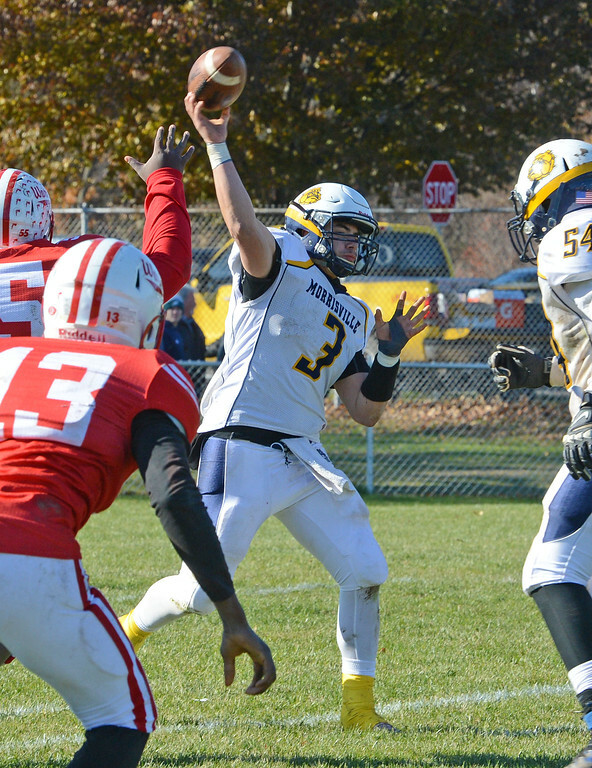 Felix Feliciano (3) threw for 100 yards. 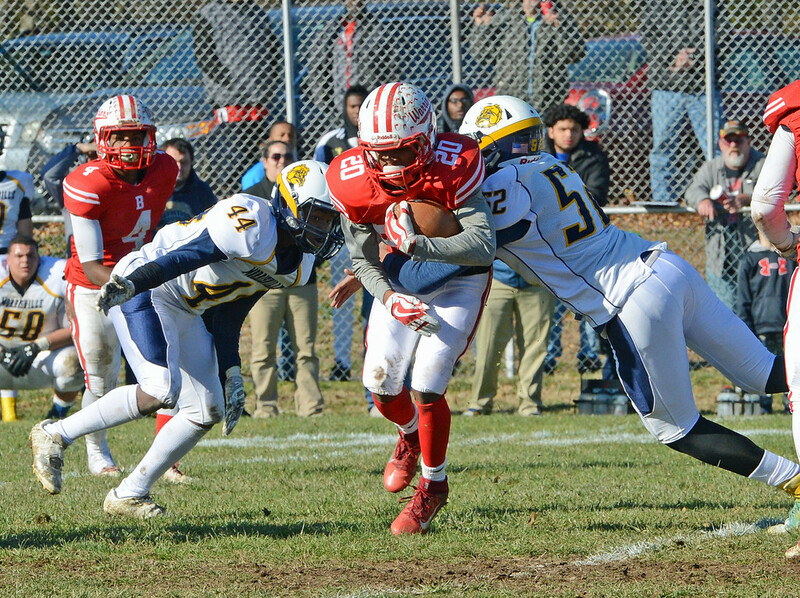 Khian'Dre Harris (25) returns kickoff for the Warriors. 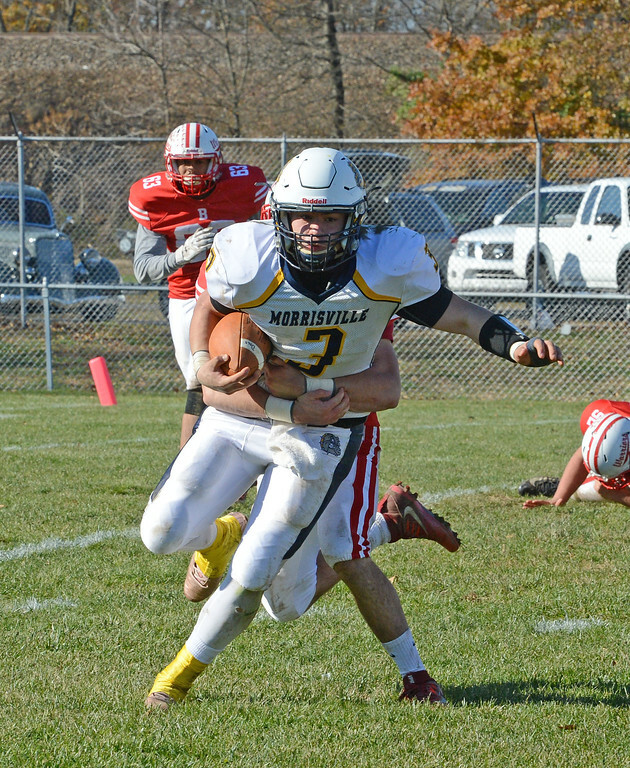 Morrisville quarterback Felix Feliciano (3) tries to break tackle. 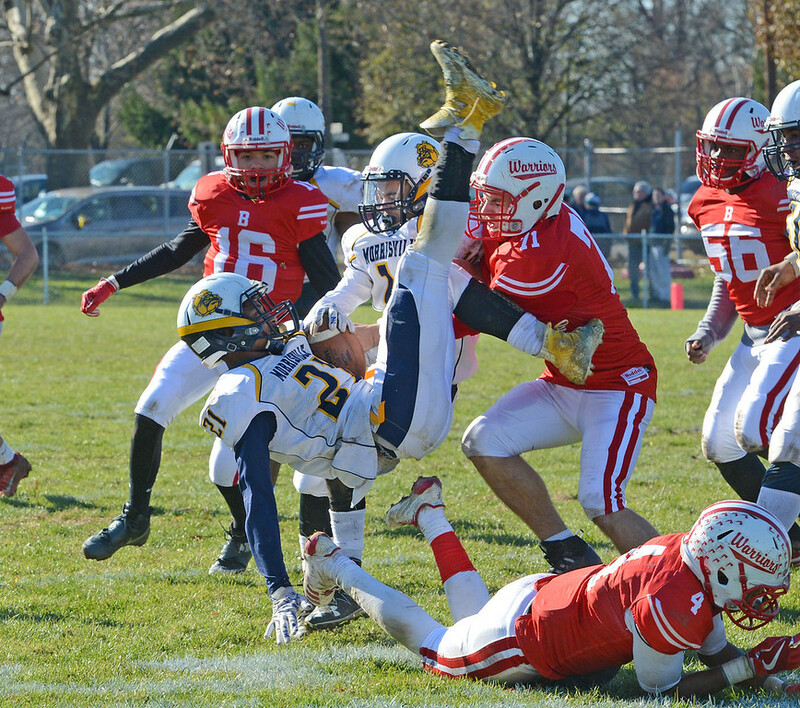 Mekhi Crooks (21) is upended by Bristol defense. 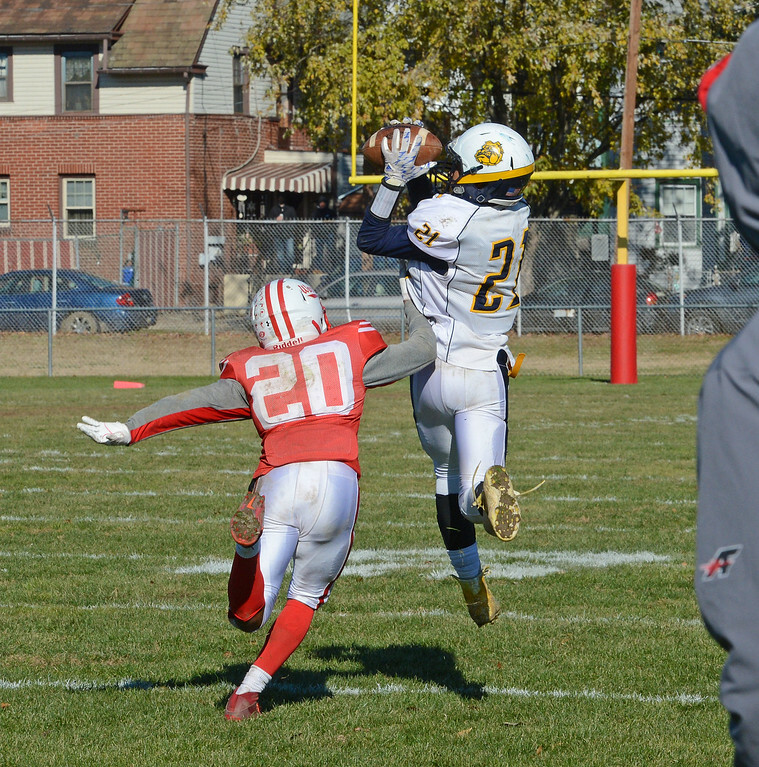 Mekhi Crooks (21) hauls in 61 yard aerial. 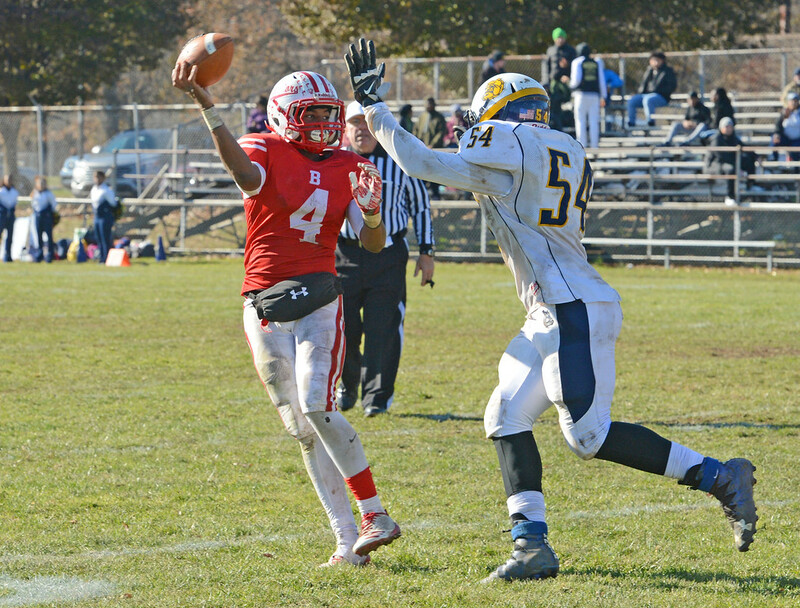 Samir Brisbon (4) gets off pass over Brian Strother (54). 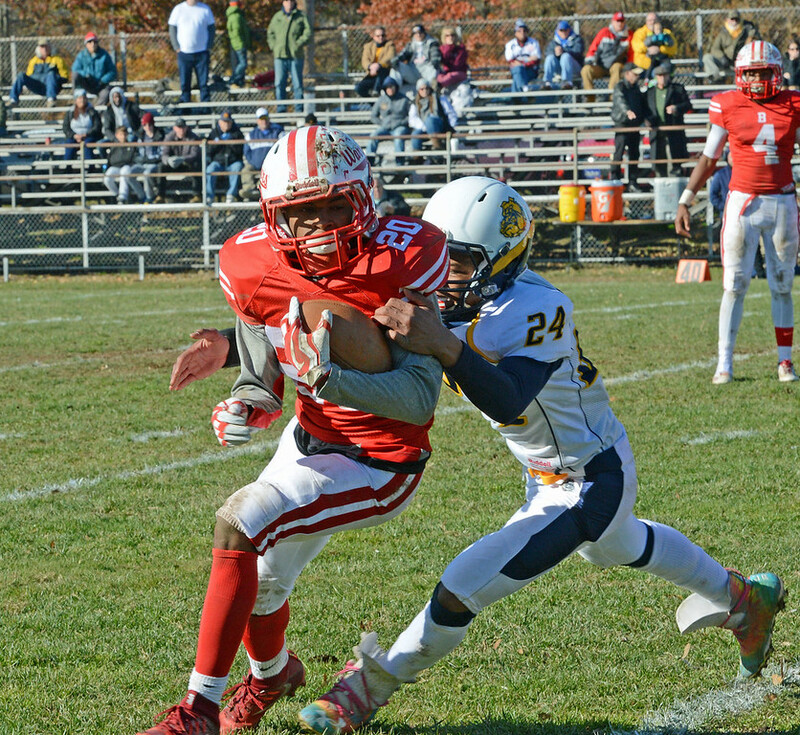 Mekhi Crooks (21) straight-arms Bristol defender. 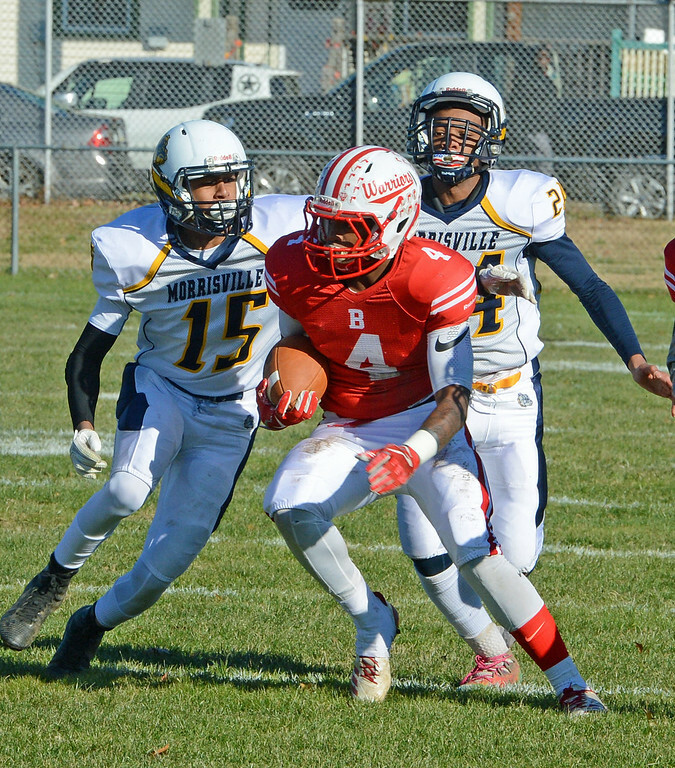 Samir Brisbon (4) returns opening kickoff.